Discussion in 'News and Announcements' started by Shaun-HiFi, Feb 16, 2011. When one person in the household is hard of hearing it can be difficult to reach a compromise over the volume level when watching TV. It’s a common problem and TV Ears headphones provide the solution. While using TV Ears headphones, the television volume can be lowered or muted without affecting the volume of the sound through the TV Ears headphones. With TV Ears headphones you can set your own volume and tone controls while others can listen at a comfortable level, or even not at all (with the TV speakers muted). TV Ears headphones are tuned specifically to enhance speech, which makes then perfect for helping you understand dialogue in films and TV shows. The lightweight (1.6 oz/46 grams) ergonomically designed wireless headset rests under the chin providing maximum comfort. It won’t mess your hair or get hot on your head. Resting under your chin makes the volume and tone controls convenient and easy to adjust. 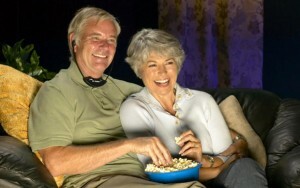 With an output power of 120 decibels, TV Ears headphones are strong enough for people with hearing loss. 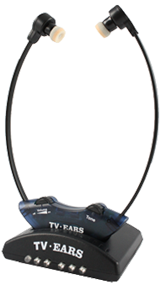 The TV Ears transmitter easily attaches to your television, satellite, or cable box and the base unit can charge up to two headsets at one time. The TV Ears 2.3 system works with Plasma and LCD flat screen TVs and in the presence of fluorescent lighting. This system can cover up to 600 sq. ft. TV Ears headsets feature the patented Comply™ Foam TV Ears Tips. TV Ears Tips provide an acoustically sealed chamber with the ear that reduces room noise and provides unparalleled comfort, cleanliness, and clarity for outstanding word discrimination so that television dialogue is clear and understandable. To purchase the TV Ears Headphones or to browse our range of TV headphones please visit the HiFi Headphones store. 1.Shop around before you buy. Try each manufacturers Hearing aids and check out their warranty. 3.Expect to change the batteries on the Hearing aid once a week. This can be expensive so if you are on a tight budget take this cost into consideration. 4.Buy two Hearing aids. You will save money if you only buy one, but you will not hear as well. You will be hearing only from one side instead of as if you were hearing with a stereo.